FOLLOWING YOUR INTUITION TO CREATE YOUR DREAM CAR. More than ever, consumers today factor their lifestyle and personality into their purchasing decisions. That also applies to buying a car: It becomes an ambassador for your personal style. 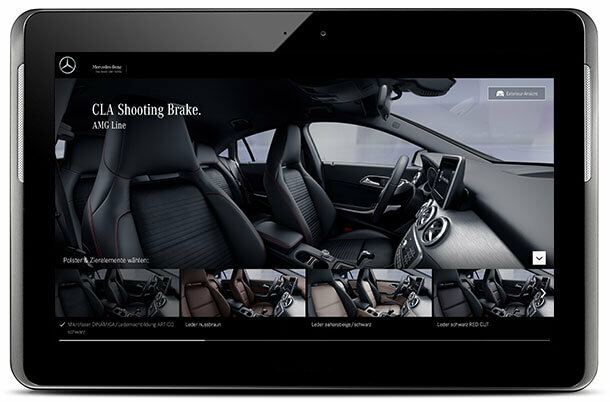 It is therefore high time to model this paradigm shift online – with our revolutionary Lifestyle Configurator. What if you didn’t configure your car from technical data, but based on your own needs and individual lifestyle? 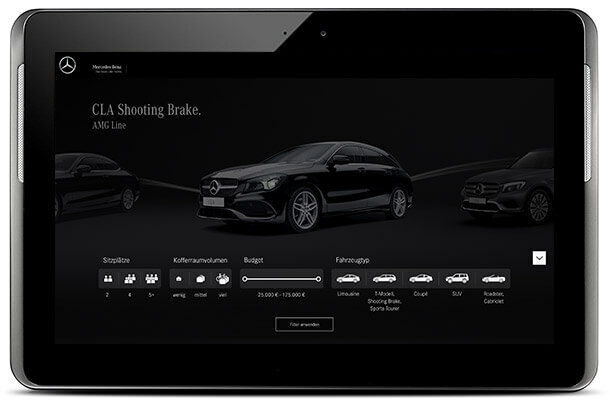 Based on this question, we, together with Nolte&Lauth, and the Fraunhofer Institute for Intelligent Analysis and Information Systems (IAIS), developed an innovative Lifestyle Configurator for, and in partnership with, Mercedes-Benz. Such an innovative feat won us three Red Dot Awards in 2016, and the coveted “Best of the Best” Automotive Brand Contest distinction in the “Digital” category – formally presented at the “Mondial de l’Automobile” salon in Paris. Conventional car configurators never start with a clean slate. They require the model, body shape and engine to be decided right from the start. Because of the greater variety of models, however, this is already too much for many customers: they often lack the technical understanding necessary to choose the right model or engine. At the end, the user plays with color shades and different wheel rims, but it is never very satisfactory, from the point of view of either the customer or marketing. 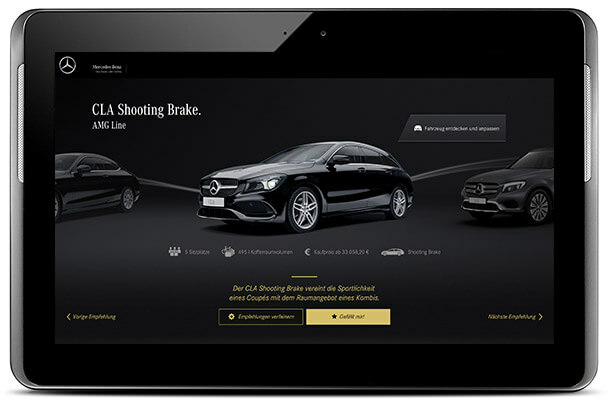 Together with Mercedes-Benz and other partners, we therefore took a different approach, and thought radically from the point of view of the customer’s personality. We would no longer ask about a preference for this or that equipment line, but about the personal lifestyle of the customer him- or herself. Not just regarding the car, but holistically. 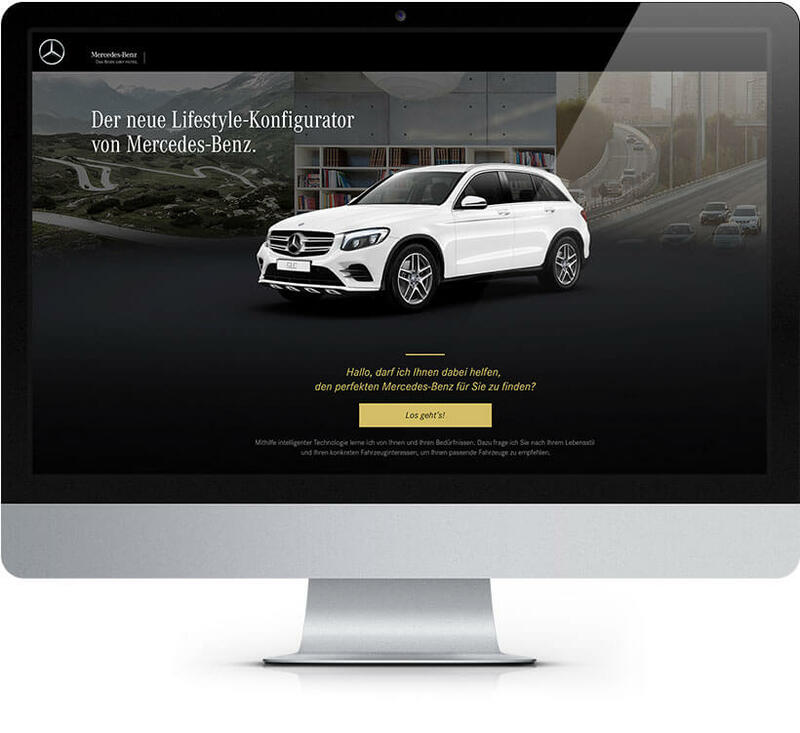 From this approach, the world’s first ever Lifestyle Configurator was born, giving customers the ideal personalized vehicle suggestions: tell me what you like, and I’ll tell you which Mercedes is best for you. 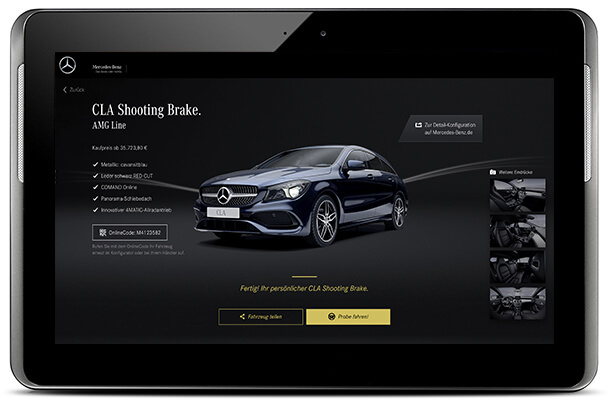 With the MercedesBenz Lifestyle Configurator, the customer chooses his personal preferences and styles from different life worlds: travel destinations, architecture, leisure activities, sport, musical taste or mobility behavior – all this “soft” information is gradually condensed into a personality image that ultimately leads the user to his own individual dream car. This very personal method is precisely what consumers want: playful preoccupation with themselves, resulting in an equally playful, but astonishingly consistent purchase recommendation. At the heart of this unique user experience is an adaptive algorithm from the Fraunhofer Institute IAIS. It gathers data, converts them into information, learns from the resulting patterns and draws the right conclusions. With each user, we improve and refine the proposals generated. Personal trials conducted by various automotive experts actually led to precisely the Mercedes standing in their own garage. The revolution lies mainly in the fact that the innovative configurator results in an entirely new form of customer dialogue. 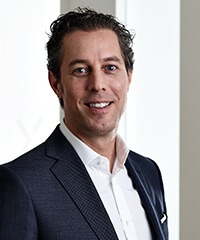 At the end of the process, it is still a Mercedes-Benz – but in a first-class sales discussion, the communication revolves first and foremost around the customer’s favorite travel destination or preferred musical genre. A disruptive concept that shows very clearly how digital one-to-one communication really works.